The Christmas season is a time for all of us to appreciate the people who make our lives special. From my family to yours, may you all have a Merry Christmas and a safe holiday season with friends and loved ones. Earlier this week, I officially opened a district office in York to help meet the needs of local residents. I look forward to seeing you there! The office is centrally located at 6872 Susquehanna Trail South in York. Residents can reach the office at 717-741-4648. The office is open Monday through Friday between the hours of 9 a.m. and 4:30 p.m.
A list of services available at the office is available here. I also plan to host mobile office hours in communities throughout the area in order to be accessible to all district residents as possible. If you have any questions or problems related to state government, or if you would like to share your thoughts on any state or local issue, please feel free to contact my office for assistance. Read more about my office here. In observance of the upcoming holidays, my offices will be closed on Monday, December 24, and Tuesday, December 25. The offices will re-open for business on Wednesday, December 26. The offices will be closed on Monday, December 31. My Capitol office will be open on Tuesday, January 1 for swearing-in ceremonies. We will resume normal business hours on Wednesday, January 2 for both offices. Please visit my Facebook Page to watch a livestream of swearing-in ceremonies on January 1. High school juniors have an opportunity to take part in a valuable one-week leadership seminar from June 16-22 at Shippensburg University. The program is sponsored by the Pennsylvania American Legion (AL) Keystone Boys State and American Legion Auxiliary Keystone Girls State. The residential seminar offers programs in leadership training, civics experience, scholarship opportunities and personal growth in a cooperative learning environment. As a proud alumnus of this program, I can personally attest to the value of this educational seminar. Participants are responsible for transportation costs, personal items and spending money, but scholarships cover the cost of housing, meals and instructional materials for the entire week. More information about the Keystone Boys State program is available here. More information about the Keystone Girls State program is available here. As an alumni, I cannot stress the importance and positive impact of the Keystone Girls State program. If you know anyone who may be interested, please encourage them to apply! York County is home to one of Penn State University’s Commonwealth Campuses. I was invited, along with Representative Mike Schlossberg (D-Lehigh), to Penn State’s University Park campus in State College on Thursday to discuss ongoing efforts to aid in mental health treatment for college students. We met with Dr. Ben Locke, who is the Senior Director of the Center for Counseling and Psychological Services at Penn State University. Dr. Locke shared his research and growing need for mental health services for young adults who suffer from depression, anxiety and other mental health diseases. When I was in the House of Representatives, I worked with Representative Schlossberg to champion a measure that allows higher education institutions like Penn State York and York College to develop a suicide prevention plan, including establishing contact information for suicide prevention hotline(s) and crisis intervention services.Unfortunately, this new law was desperately needed. Our discussion yesterday ranged on ways we can improve healthcare for college students to ensure they receive the treatment they need, as well as new tools and programs that can help prevent suicide on our college campuses. 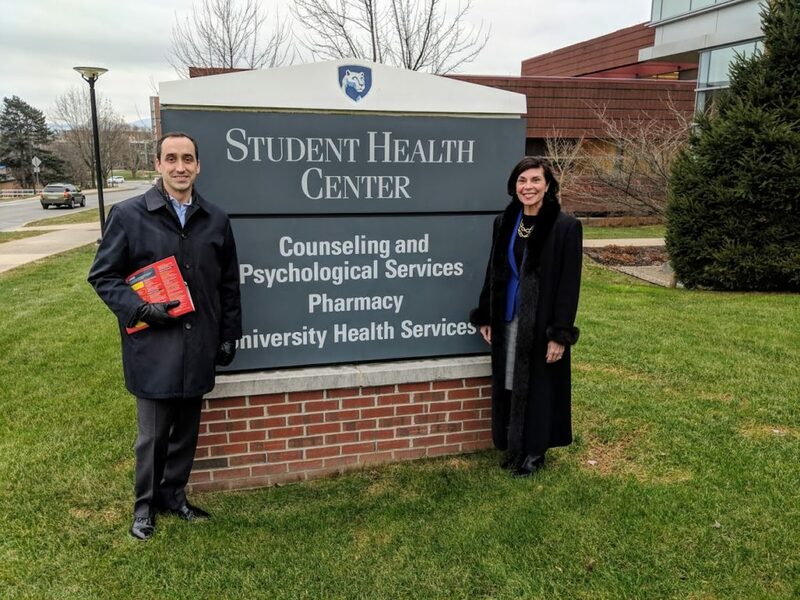 Here is a photo of me with Mike Stefan, who is the Director of State Relations for Penn State, outside of the Student Health Center on campus. Young community residents can learn more about the various species of birds in our area during an educational event scheduled to be held at Nixon County Park on December 27 from 9 a.m. until 11 a.m. The Kids Christmas Bird Count is available for children ages 8 and older. Mentors from York Audubon will be available to help young people identify birds and submit their findings online. Participants must register by December 24 by calling (717) 428-1961. All children must be accompanied by an adult. More information about this program and other services hosted by the York County Department of Parks and Recreation are available online at www.yorkcountyparks.org. Did you know your dog must be licensed by January 1? Dog owners may purchase an annual license or a lifetime license. Owners of unlicensed dogs may be subject to a fine of $50-$300. Please visit the York County Treasurer’s Office for more information on how to license your dog. According to the Pennsylvania Department of Agriculture Bureau of Dog Law Enforcement, a current license is the fastest way to have a lost dog returned home rather than having it become a statistic among the more than 5,000 dogs in shelters across Pennsylvania. Earlier this week, the new “Steer Clear to Get Around” law took effect. The law requires motorists to slow down to go around waste and recycling collection trucks as well as mail trucks and tow trucks that are stopped or traveling below 10 miles per hour along the side of the road. Several local residents were interviewed for this Fox43 story on the new law, which you can watch here. These vehicles will use yellow strobe lights to alert motorists to “steer clear to get around” when approaching. Today is also the most heavily traveled day of the holiday season, according to AAA. Please be safe if you are traveling to spend the holidays with family or friends. 511PA is a great place to review the latest travel conditions and receive alerts of any incidents you need be aware of along your route. Please visit 511PA for the latest information, as well as download their smartphone app for Apple and Android. The Pennsylvania State Police is reminding motorists to drive sober or get pulled over. On Sunday, December 23, a new law will take effect to increase penalties on repeat DUI offenders. Someone who is guilty of driving under the influence for a third time within a 10 year span is subject to a felony penalty. If a DUI results in a fatality and that person driving under the influence has a prior DUI conviction, he or she would be subject to a minimum prison sentence of five years. If a DUI results in a fatality and that person driving under the influence had two more prior DUI convictions, he or she is subject to a minimum prison sentence of seven years. Please remember your loved ones if you plan to celebrate the holidays. Drive sober, or get pulled over. Have a very Merry Christmas and a safe and happy holiday season!